Since we do quite a lot for Halloween, I don't usually do much decorating for autumn proper. But this year felt a little different since A was starting school and I was just so over the summer humidity. 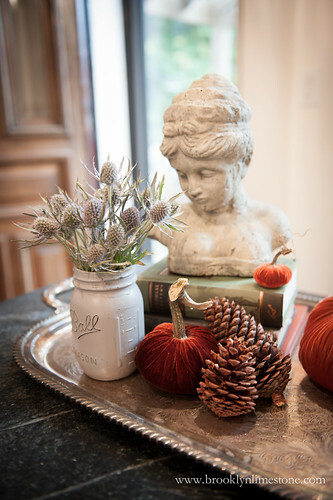 I thought maybe decorating for fall in 90 degree weather would will cooler temps into being. And it worked! Magic. You're welcome New York City! 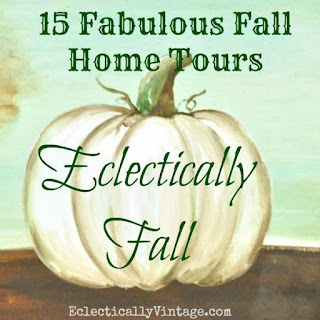 Seriously, I'm thrilled to be joining this year's the Eclectically Vintage Fall Home Tour with 15 other wonderful bloggers whose fall decor game is just so strong. Click here check them all out! Now let's get to the tour. I knew I didn't want to buy a bunch of new things I had to store. 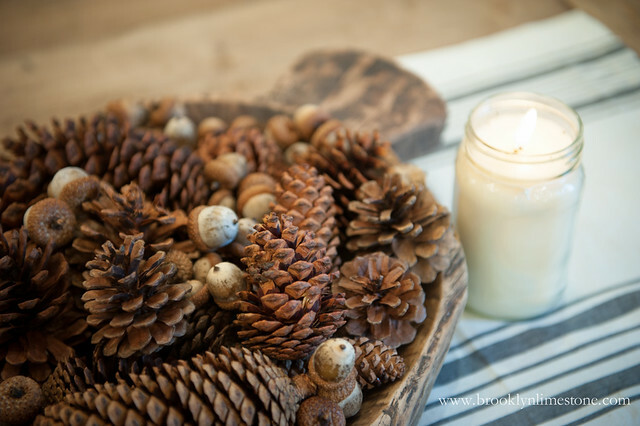 So instead I used bits of nature's glory - pinecones, apples, acorns, etc. - to surround myself with the best parts of my absolute favorite season. Added bonus is that these things transition so perfectly into winter too so no waste. 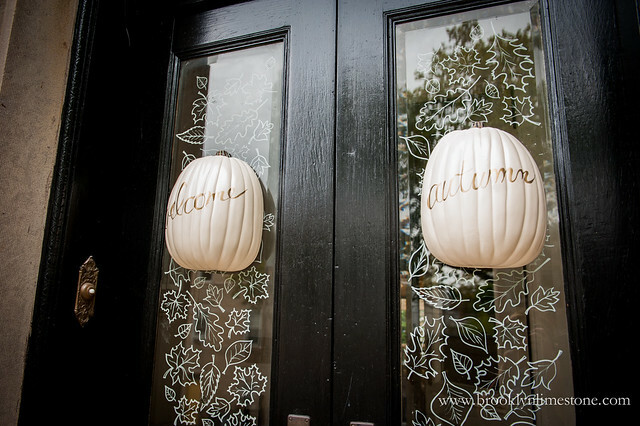 Hand drawn leaves, mums and pumpkins outfit the front door. I wanted this to be a fun backdrop for first day of school pictures. 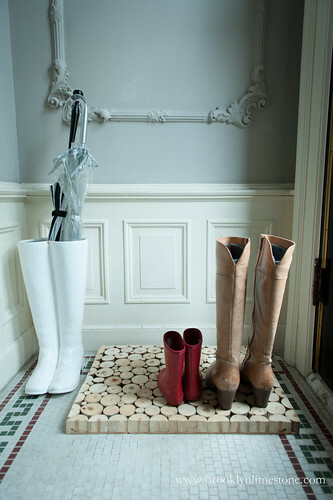 Out came last winter's DIY wood slice boot mat since I'm just yearning to wear boots again. 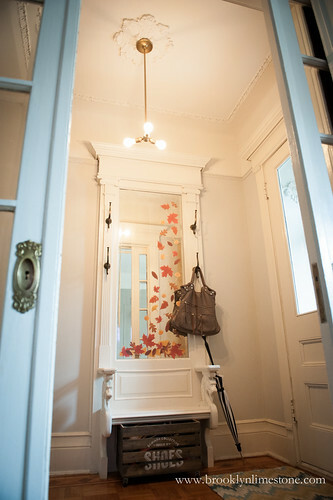 And in the front entryway, a few paper leaves decorated the hall stand mirror. 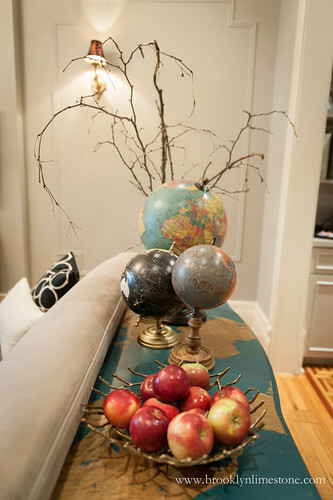 In the living room, a vintage tray and bag of apples made for a easy coffee table centerpiece. 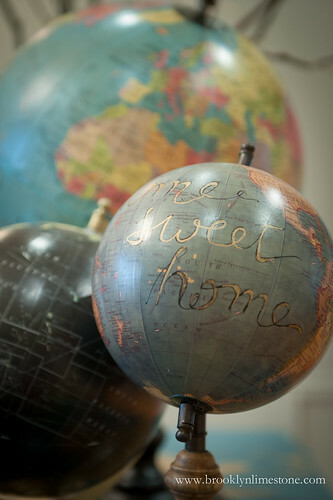 I made my mark on a mini globe and paired it with a few other favorites I had elsewhere. 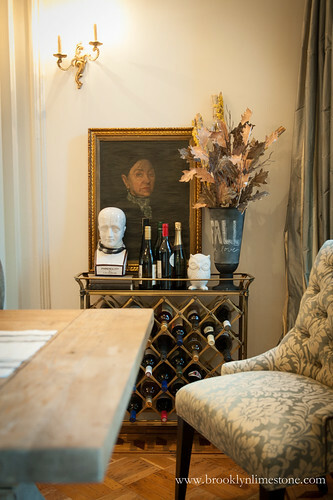 The dining room - perhaps where we spend most of our time - got lots of little touches to make fall entertaining festive. 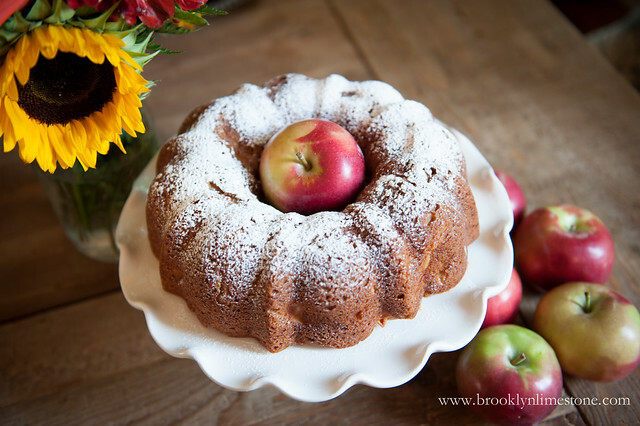 And finally I couldn't forget a little kitchen love where I turned some extra apples into a super yummy and fragrant apple cinnamon cake that was a big hit with the whole family. Hope you enjoyed my little tour. Want more fall goodness? Head over to Yellow Prarie Interiors and Primitive + Proper to see lots more decorative inspiration! Oh I love it - makes me want to come over in my Octomom costume and mix us up a batch of appletinis! Thanks so much for joining the tour this year! Could post the recipe for the apple cinnamon cake?  Also Centsational Girl is looking for places in Brooklyn to visit and you're the perfect expert on this. Melt the butter in the microwave, and add brown sugar and eggs, whisking until smooth. Gradually mix in dry ingredients just until combined- don't overmix. love all of the natural touches! 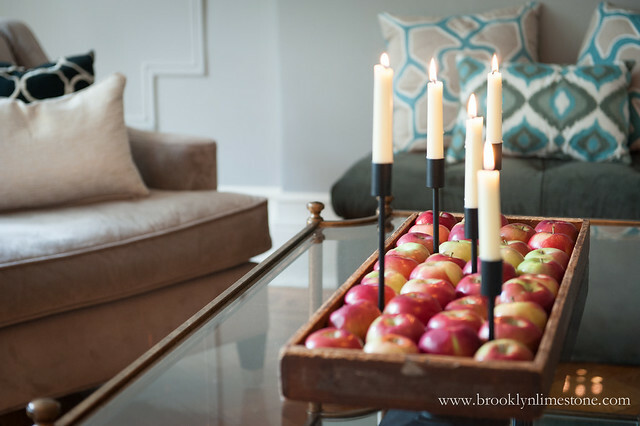 i the tray of apples with candles is awesome! Everything looks so lovely! 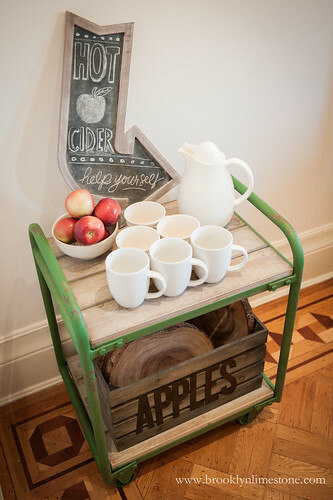 I especially love the tray with the apples and the candles...so unique! How did you hang the 1/2 pumpkins? Looks lovely. I really like the tray of apples with candles. Nice idea. I always love your house even more than normal this time of the year! It looks awesome as always! I also saw that sweet baby girl of yours went to preschool, I hope she's doing great and having fun. My baby boy is around the same age as her so when I see them going off to school I gotta admit it pains my heart!! 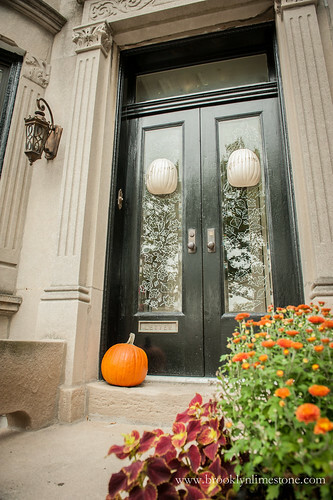 love the leaves on the front door! Details, please? Did you actually hand draw e-v-e-r-y one? I did draw them but it didn't take too long. I found a falling leaf image I liked and taped it to the other slide of the glass and loosely traced. So pretty quick work actually. 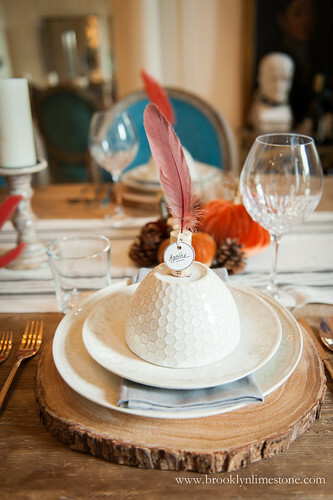 Absolutely simple and perfect autumn decor! May I ask what you used to draw the leaves? I used a chalk marker which writes and erases easily on any non porous surface like glass. 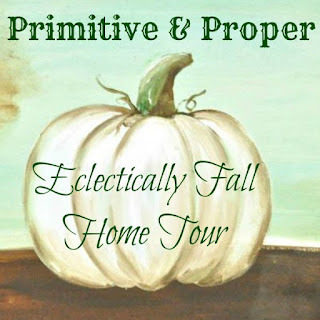 I love your fall entry! What did you use to paint/draw the leaves on your door? I want to copy your idea! Love. All. Of. This. ;) seriously! 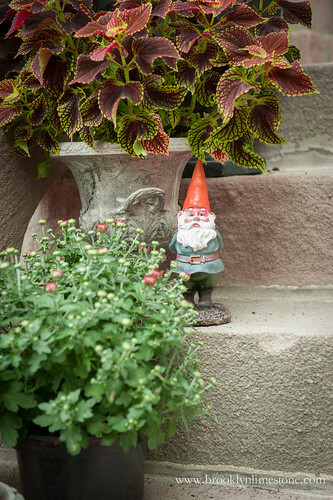 Excited to "meet" you through this home tour! My friends live on your block and we walked by yesterday...I need glasses so I couldn't see what was on the pumpkins but I did notice them on your door. I thought it was early for you to be doing Halloween! Unlike you I am not at all ready for fall. Long live flip flops. Did you cut the pumpkins in 1/2 yourself?